It seems to occur without fail every time a natural disaster wreaks havoc and destruction that economists insist that the devastation will be a positive for the economy. Though obviously sympathetic to the grievous misfortune and horrific losses caused by the three devastating hurricanes (Harvey, Irma and Maria) over just a three-week period, experts again retrieved this narrative with the understanding that large sums of money will be spent afterwards to repair and rebuild. What is ignored is that all the money spent on cleanup and reconstruction are dollars that are syphoned away from otherwise productive uses. Wealth and opportunity surrender to simply replacing what is lost. In economics and many related fields, analysts need to distinguish between stock and flows. A stock represents a quantity at a point in time while a flow represents a change over a period of time. In accounting terms, this is the balance sheet versus the income statement. Gross domestic product (GDP) is an imperfect measure of the growth of a country’s economy and is a flow measured in the number of dollars spent over a particular interval. Though rarely talked about, the U.S. capital stock represents the total value of all real assets at a specific point in time. Think of the flow as the movement of water from a faucet that can go from a trickle to a fire hose. The sink represents the capital stock of a country’s assets that increases as the water pours down. However, if the drain is opened the additional flow of water at any power will not raise the overall stock of water. Houston is the fourth largest city in the country. Together the states of Texas and Florida rank second and fourth, respectively, in terms of their shares of total U.S. GDP and account for about 12% of our collective economy. Thousands of people in Houston and south Florida alone lost their homes, cars and possessions and many are now without jobs as thousands of businesses shuttered for weeks if not longer. Without the devastation of Harvey and Irma, these people and businesses would have all been working and producing something that added to our GDP. Now they are not. However, getting these regions back on their feet again will generate a lot of spending on new homes, office buildings, cars, etc. Just getting back to where they were and restoring what these storms destroyed is not growth. But to our method of calculating GDP, it will look like production. We have noted for the last 18 months the excess inventories in the auto sector as demand rolled over. This has already been a drag on recent economic releases and we felt would continue to impact manufacturing, employment and consumption as a modest negative. This will not be the case at least over the next few quarters. Florida and Texas rank second and third in terms of auto demand, so there will be a boost to auto sales and, incrementally, to U.S. GDP as it is estimated that up to 500,000 cars were damaged or destroyed during Harvey and another 200,000 during Irma. Additionally, both states will see an immediate demand for cleanup and construction workers that should boost wages especially given the shortage of these workers in Florida. Even before the hurricanes, construction firms around the U.S. reported trouble finding enough workers. The Bureau of Labor Statistics reported 225,000 construction job openings in June, up 30% in the last year and 125% since 2012. As older workers left the construction industry following the housing bust, many moved to other industries such as energy or manufacturing or left the workforce. This shortage is especially acute in many southern metro areas with most contractors struggling to fill positions like carpenters and concrete workers. The hurricanes have obviously exacerbated these shortages with Harvey alone having destroyed about 30,000 homes in the Houston area. We can expect a lot of short term noise around economic releases over the following three quarters with an early drag due to lost consumption followed by the increases noted above. To accent the potential distortion on economic data, the early estimates for September’s light vehicle sales hit 18.47M at an annualized rate (a/r), a level last achieved in 2005. This follows a six-month average of 16.62M a/r and represents about an additional 162,000 cars sold during the month. The challenge with many economic releases over the next few months will be to distinguish what is noise versus trend. Following a near two year period of softening economic growth, U.S. Gross Domestic Product grew at an annualized rate of 3.1% in 2Q 2017-the strongest pace of gains since the opening quarter of 2015 (see chart below). We are clearly noting the increasing contributions of capital spending and exports to overall growth in recent months and look towards continued strength in these areas for the balance of 2017. However, these two inputs represent less than 20% of the overall economy. From mid-year 2015 through the first quarter of 2017, the U.S. economy slowed further from the already tepid 2.2% (a/r) of GDP growth achieved since the depths of the recession. The seven quarter period generated a near stall speed rate of growth of only 1.5% a/r with slowing consumer spending the major factor. Consumer spending accounts for nearly 70% of our GDP calculation and slowed demonstrably from a 3.5% pace in 2014-2015 to a 2.67% a/r during the period noted. 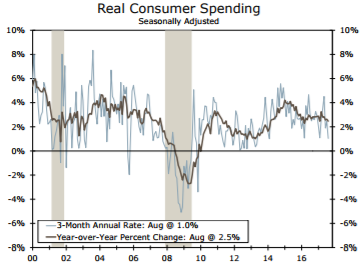 Despite consumer spending enjoying a rebound in the recently released 1Q period to a level of 3.3%, we continue to see signs of slowing consumption. Large durable purchases on housing and autos have been a critical component of spending growth during this economic expansion. We have noted the softening in auto demand for the better part of two years but now the contributions from the housing sector appear to be flatlining as well as shown in the chart on the next page. These two highly interest rate sensitive areas will continue to be pressured by the Federal Reserve’s tightening mission. With wage gains remaining subdued despite strong levels of job growth, we remain more cautious on the contributions of consumption to economic growth. 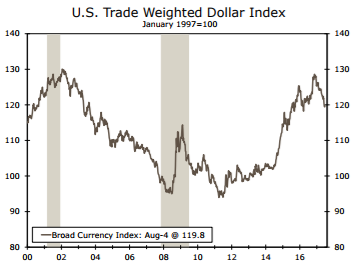 On a trade-weighted basis, the U.S. dollar has been in an uptrend since mid-2011 (chart below left). 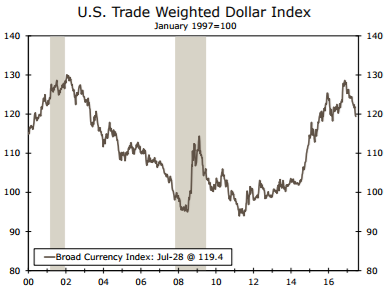 However, after reaching a 14-year peak late last year, the trade-weighted value of the dollar has dropped more than 8% in 2017 through the end of September. By reducing the foreign-currency price of U.S. goods and services, a weaker dollar should continue to help boost American exports. 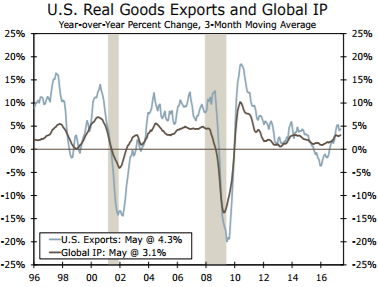 As noted above and shown in the chart below on the right, growth in real exports of American goods has already picked up this year. However, U.S. export growth is much more sensitive to changes in foreign economic growth than it is to changes in the real exchange rate, thus U.S. manufacturing has benefitted from the synchronized global expansion. After slicing an average of nearly 0.7% from GDP during the prior 18 months as the dollar appreciated 10%, net trade has contributed positively to GDP in four of the last five quarters benefitting from the recent weakness in the currency and accelerating global growth.The recent reduction in the advanced look at the trade deficit indicates this will continue in the 3Q release. Growth expectations for the balance of 2017 are even more challenging to predict than usual as the timing of the hurricanes’ impact on consumption and production are unknown. We expect 3Q to slow from the pace of the second quarter towards a 2% growth rate with the final quarter read exhibiting more of the impact from the rebuild. For the full year, we are maintaining an expectation of above trend growth in the range of 2.25%-2.50%, a level that could be buoyed by increased wage growth and the successful enactment of individual and corporate tax cuts. As we enter the final quarter of 2017, attention in the markets and economy now focuses upon the latest iteration of the tax reform plan from the Trump administration. Though unlikely to pass in the current form, the following comments pertain to what it is we do know. Perhaps the most important change would apply to U.S. corporations and not individual taxpayers. Though optimistic overall, we remain a little circumspect on the perceived economic impact on corporate America. We are more confident that a full expensing of capital investments will aid very tepid capital expenditures and a 25% tax rate for pass-through businesses should benefit small business growth. The proposed reduction in the corporate tax rate to a level of 20% from the current level of 35% (with most deductions reduced or eliminated) is designed to make American companies more competitive with global counterparts with a cut to this level estimated to increase corporate profits by as much as 7%. There are offsets, however, as a change in one variable often has countering impacts elsewhere. Firstly, according to Howard Silverblatt of Standard & Poor’s, the effective tax rate of companies in the S&P 500 is already only 25.6% with 115 of the 500 companies having tax rates below 15%. Additionally, Ned Davis Research analyzed the drag on earnings, should interest expense no longer remain deductible and found the benefit shrinks to 2.6%. Lastly, one could expect a more aggressive and hawkish Federal Reserve with rising interest rates offsetting some of the reflationary impacts of a corporate tax reduction. This would increase the overall interest expense at a time when total corporate debt is near historic levels. If implemented, the tax cut is a one-time reset on corporate earnings and does not increase the long-term growth rate. Indeed, the impact on S&P 500 valuations may also be offset by the commensurate acceleration in interest rate increases that would likely serve to lower the P/E multiple on earnings. An additional aspect of the tax proposal is repatriation of corporate funds held overseas (currently estimated at $2.5T) and the territorial tax reform that will make the flow of capital more agnostic and efficient. However, corporations may have already front run this return of capital via large debt issuance that was already deployed for stock buybacks over the prior few years. Work done by Peter Boockvar has noted that four of the largest holders of overseas funds (Apple, Microsoft, Cisco and Oracle) have added $168B of cash to their balance sheets over the last three years and $174B of debt that was used mostly for stock buybacks. This indicates that it is more likely that the return of these funds will largely be deployed to pay down the existing debt rather than be used for additional stock buybacks or other corporate actions. As noted above, the trade-weighted value of the U.S. dollar has fallen 8% this year (chart below left). Although the weaker dollar could cause import prices to drift higher, it likely will have only a small effect on rates of CPI inflation. The U.S. economy is largely a service-based economy, and the vast majority of services are produced and consumed domestically. Imports are more important in terms of goods consumption, but rates of inflation in the goods market also tend to have low sensitivity to exchange rate changes. 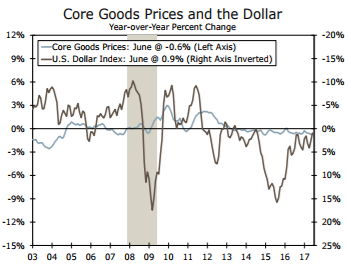 The chart below on the right illustrates a low degree of correlation between the year-over-year change in the value of the dollar and the year-over-year change in core goods prices. We noted last year that as the impact of lower oil prices and the strong dollar faded in the rear-view mirror, both headline and core personal consumption expenditures would increase throughout the year from a lower base level. As the market expectations and optimism for more pro-growth policies from the Trump administration continued into the new year, the PCE deflator achieved the target 2.0% level in January for the first time since 2012. Our view had been for this to be a cyclical rather than a structural change in inflation readings. Since February, headline readings have been in retreat. What is perhaps more perplexing for Janet Yellen and the Fed is that core inflation has also slowed since the start of the year. 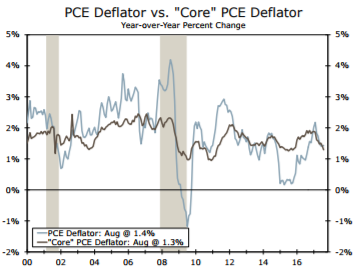 After finally broaching the 2% target of the FOMC in January, the most recent reading for August of the core PCE deflator has fallen back to 1.3% on a year-ago basis (chart below left). More indicative of slowing inflation is the six-month annualized rate now below 1% at 0.9%. Core CPI has slowed equally dramatically, falling from 2.3% to 1.7% in August. 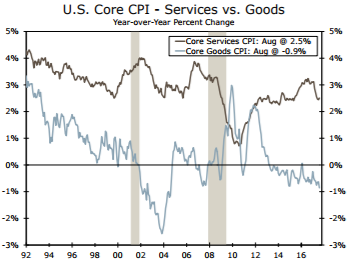 A breakdown of core goods and core services shows that both have weakened since the start of the year and contributed to the moderation in inflation (chart below right). As with many of the data points we are and will be seeing, Hurricane Harvey added temporary support to the headline CPI reading in August following a jump in gas prices tied to refinery outages. 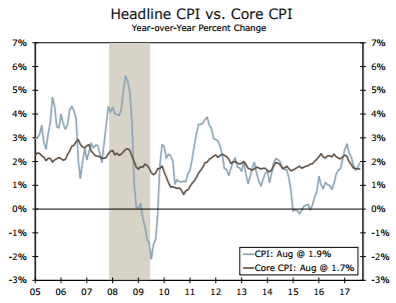 After five months of extremely low readings, the August CPI rose +0.4% m/m lifting the year-over-year level back to 1.9% (chart below left). It is estimated that over half of the monthly gain was caused by the spike in energy which rose 2.8%m/m. Aside from temporary spikes, the shelter component of core CPI (ex-food & energy) continues to elevate inflation readings. As the chart below on the right indicates shelter costs (noted by the blue line) are rising at a 3.3% a/r. 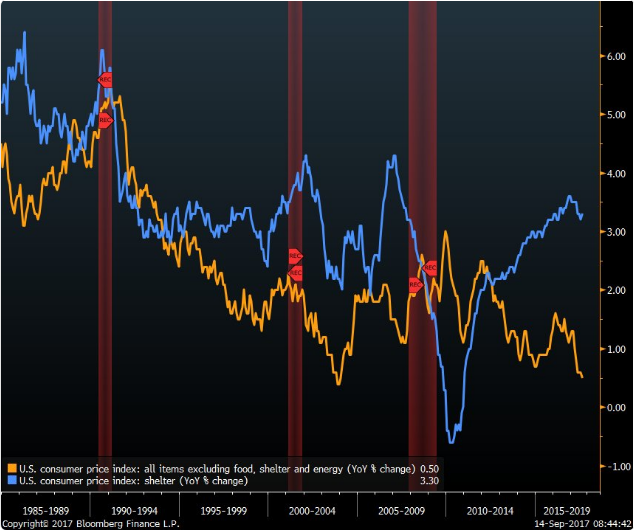 The core CPI reading moved up to a still tepid 1.7% y/y but removing the component of shelter from the calculation leaves the index at a near flat 0.5% increase (noted by the orange line) over the last 12 months. At the end of September, the Federal Reserve confirmed what had long been telegraphed regarding the start of the great reversal of Quantitative Easing (QE) that had swelled the balance sheet from around $800B in 2007 to the current level around $4.2T. The balance sheet adjustment is expected to continue for several years. Based on New York Fed staff projections, the Fed’s security holdings are likely to shrink by roughly $1.5T-$2.0T over the next four to five years (see chart below). The Fed is optimistic that the unwinding will have little impact on the capital markets as the balance sheet reduction will be as passive and predictable as possible and done by phasing out the Fed’s current practice of rolling over maturing assets, and not by outright sales of assets that might overwhelm demand and increase interest rates. Additional confidence is regulatory as banks must maintain a certain balance of high-quality liquid assets such as bank reserves and Treasury securities. The draining of reserves from the banking system as a result of the Fed’s balance sheet reduction will likely increase banks’ demand for Treasury securities, providing a powerful offset to the increased supply of Treasuries. This all looks good on the Fed drawing board. However, the risk is that the balance sheet adjustment with QE being unwound, may unravel the positive impact on financial asset prices, especially when other central banks, including the ECB, are adjusting their policies simultaneously. If easing financial conditions helped pave the way for the surge in financial assets and stable economic growth, it stands to reason that the obverse could weaken economic growth also outside the United States. The nonfarm payroll report was littered with such inconsistent messages that we are disinclined to interpret the data in concert with prior trends. In total, payroll employment contracted by -33K, the first jobs’ decline in over seven years. During the survey reference period, 1.5MM people reported they were unable to get to work as Hurricanes Harvey and Irma disrupted work and routine hiring. Though we have long anticipated a rise in hourly wages, the jump of 0.5% m/m in the wage data for September and from 2.5% to 2.9% on a year-over-year basis stretches credulity and should be largely ignored as a decline of over 111K leisure & hospitality workers led the jobs decline. This outsized decline reflects the impact of lower hourly wage workers (an average of $15.55 per hour for this group versus a national average of $26.55) that could not get to work during the storms. This elimination from the total skews the wage data upwards and should prove temporary. We will await the data from the October and, perhaps, November reports before passing final judgement though we remain optimistic on the firming of future wage gains. Rather than just looking at average hourly earnings, a more comprehensive view of total employment and aggregate earnings shows a somewhat more tempered picture. This is especially true when adjusted for inflation that while lower in 2017 is markedly higher than levels of mid-2014 through much of 2016. As would be expected late in the economic cycle as we near full employment, the rate of growth in annual employment levels starts to decelerate and Nonfarm payroll growth has now slowed to a level of 1.2% year-over-year and is only minimally impacted by the recent report. The chart below depicts aggregate payroll data on a year-over-year basis going back to 1980 adjusted for the rate of inflation. Real aggregate income growth combines multiple factors that are all critical to understanding the total wage impact on the consumer. 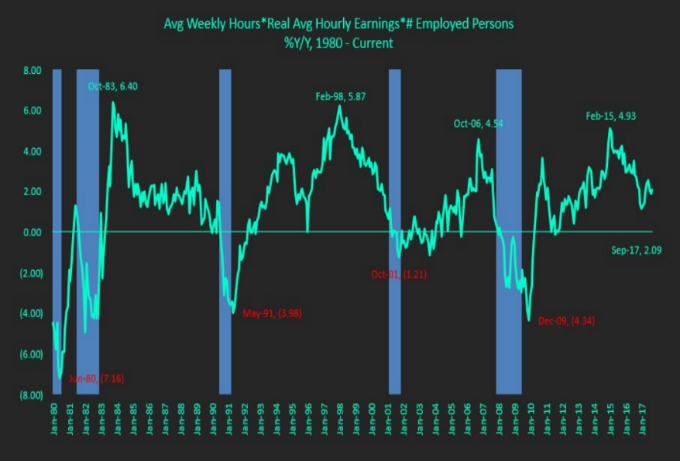 This is calculated by multiplying average weekly hours by real average hourly earnings which generates average weekly earnings adjusted for inflation. We then multiply that product by the total number of employed persons to arrive at the total for aggregate income. 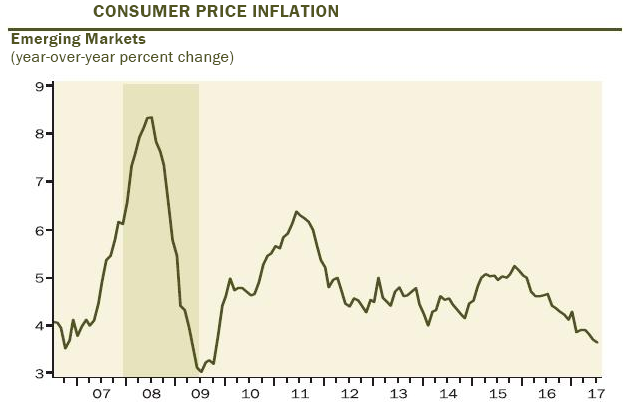 The slowdown in employment growth has combined with modestly rising inflation to slow growth in aggregate income to less than 2.1% and may explain much of what we have seen recently in both tepid consumer spending and declining savings rates. Prior to the turn of the century, population growth was such that the U.S. economy needed to generate about 150,000 jobs per month just to keep the unemployment rate steady. The aging baby boomer impact on demographics has lowered the number of jobs the labor market needs to create to absorb new entrants, and estimates currently are about half of the prior level or around 75,000. Even before the hurricane-impacted September payroll report, job growth (though slowing) was still near a 180,000 per month pace pushing the unemployment rate further below what is assumed to be the natural rate. This has occurred with a nearly stable (and way below historical) labor force participation rate (the proportion of people employed or looking for work in the U.S.). The civilian working age population along with the sustainable trend in labor force participation are variables that influence job creation. Increases or decreases in either allow the labor market to add or lose jobs without changing the unemployment level. Participation rates are critical and can be impacted by both structural and cyclical factors. During the last half of the 20th century, dramatic increases in female labor force participation rates had a profound positive impact on job growth rates. Now we are experiencing the opposite impact as every year 1.5MM baby boomers turn 70 years of age putting downward pressure on participation rates. The U.S. labor force participation rate stood at 62.9% as of the August report, a level down from 66% in December of 2007 just prior to the recession and a peak of 67.3% in early 2000 (blue line on chart on next page corresponding to left hand scale). This is consistent with other research that has assigned primary responsibility for the decline in participation to demographics and other structural forces, (note-some economists argue that lingering cyclical weakness in the economy has continued to depress labor-force participation). But it remains the red line in the chart on the top of the following page that is more concerning as that is the labor-force participation rate for prime age (25-54) workers that should minimize the impact of demographics. This rate currently stands at 81.6% down from the peak in 1999 of 84.6%. The participation rate for prime-age men in the U.S. has been falling since 1954 for various reasons, including diminished opportunities for less-educated workers as industries shifted away from manufacturing towards services. Female prime-age participation, meanwhile, rose for decades as women entered the job market in ever-larger numbers. But that began to edge lower after the 1990s. For every unemployed American male between 25-54 years of age, there are estimated to be another three that are neither working nor even looking for work. A recent study by Alan Krueger, former chairman of the President’s Council of Economic Advisors, noted that nearly half of all prime working age male labor force dropouts currently take pain medication daily. Two-thirds of those men (about 2 million) take prescription pain medication. Krueger’s work with the Brookings Institute also suggests that the increase in opioid prescriptions from 1999 to 2015 could account for about 20% of the observed decline in men’s labor force participation during that same period, and 25% of the observed decline in women’s labor force participation. Another 21% of this group were Medicaid beneficiaries and nearly 57% were collecting disability benefits. While these social programs obviously do not support a lavish lifestyle, they do offer an alternative to re-entering the work force. Additionally, America’s population of non-institutionalized adults who have a felony conviction somewhere in their past has now exceeded 20MM as of the end of 2016 limiting their ability to obtain employment. The chart below indicates that as many as 2MM workers would be currently employed if the labor force participation were the same as prior to the recession. The concern with this data point, along with the argument for remaining excess capacity, is whether the group weighed down by increasing levels of disability, drug use, incarceration, and inadequate skill sets will ever be able to re-enter the labor force. In the aftermath of the Great Recession, real consumer spending grew at a paltry 1.8% annual rate in the period from 2009-2013-barely half the long-term average. Though spending from that point did pick up briefly as gas prices plummeted, it has markedly slowed to a pace of 2.5% since November of 2015. It is critical to note that November 2015 coincides with the personal savings rate peaking at a level of 6.1%. This has since dropped to 3.6% as of the most recent reading (chart below right). This compares with a 20-year average around 5%. 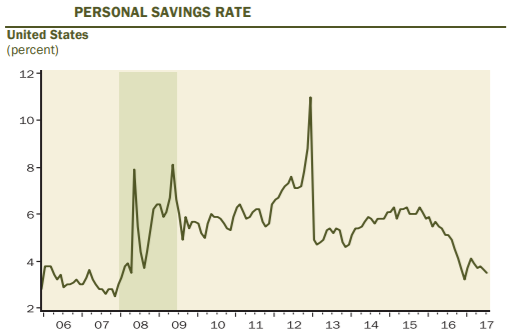 This low savings rate has supported only tepid levels of consumer spending (now down to 2.5% y/y and only 1.0% on a 3-month annualized rate shown in the chart below left) accenting how tenuous the current nature of the consumer appears. Perhaps the wealth effect has had some impact as it appears that a half-decade of steady asset price increases has relaxed consumers’ tightfisted post-crisis behavior. The decline in the saving rate, however, raises some longer-term concerns about consumer spending. The saving rate can’t decline indefinitely. Real income growth will have to accelerate for consumers to continue carrying the economy and that may require inflation to remain subdued. With the labor market now near full employment, the growth in hours worked is set to slow. To maintain income growth, a pickup in either labor force participation or labor productivity is needed. The needs and preferences of consumption in America have changed dramatically over the last 10 years and are clearly having an impact on overall spending. For example, 10 years ago the total cellphone market in the U.S. approximated $10B. In 2017, this is approaching $200B. Add in the increased expenditures on wireless services that are estimated at $150B and cellular related spending, which previously did not exist, now represents almost 3% of total consumption. But while that is only a re-shuffling of how consumers spend their money, the increase in the cost of the most basic needs dwarf the overall inflation statistics. Though the headline CPI since the start of the decade has only increased at an official rate of 1.55% a/r, the cost of shelter has increased over 2.72% per year. More impactful, perhaps, are the changes and responsibilities in the cost of healthcare where not only have overall costs soared but the burden has further shifted to the consumer. In the just-released study performed by the Kaiser Family Foundation on employer health plans, annual premiums for a family plan rose to $18,764 with employee contributions of $5,791. This contrasts with the data from 1999 showing a total cost of $5,714 with a worker contribution of $1,543. The cost of such a plan for the average worker has grown at a 7.54% compound annual rate over this period. Over the same time-period, nominal incomes have grown at a 2.1% annualized rate. However, that is only the cost of the coverage. What has recently been holding premium growth down has been the accelerated move to high-deductible plans where the employee is responsible for increasing amounts of out-of-pocket costs prior to most coverage kicking in. For the average family, this deductible now exceeds $3,300, an increase of over 230% since 2005. The consumer is clearly under pressure. 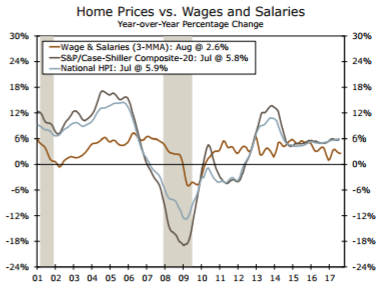 Based upon the traditional drivers of housing demand such as employment, wages and mortgage interest rates, one would expect the U.S. housing market to be fairly robust. This would be especially true of the first-time buyer cohort that has witnessed both employment and wage growth growing faster than the averages in the last three years. It is assuredly not, however, as affordability and the continued lack of housing supply have been major impediments and are now fostering a softening market. 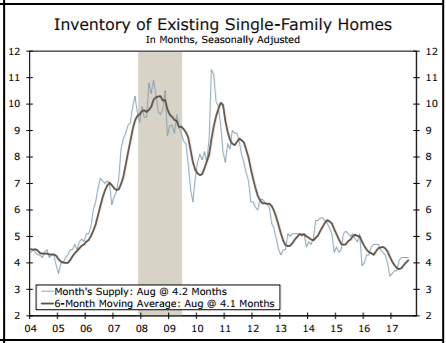 Inventories of single family homes (chart below left) are very seasonal and are currently at the lowest level for this time of year since the 1990s. This tight supply has precipitated price increases on the S&P/Case-Shiller Home Price Index since the end of 2012 in excess of 5% per year (currently about 6%) at a time when incomes are increasing at half that rate (chart below right). Many local markets are seeing double digit annual gains. The Federal Reserve lowered interest rates in part to spur demand especially in the housing area, a very interest-rate sensitive market. Perversely, they have created a vacuum of supply. During the housing crash both professional and individual investors gobbled up hundreds of thousands of foreclosed properties and turned them into rentals. There are currently 8 million more renter-occupied homes than there were in 2007, the peak of the housing boom, according to the U.S. Census. These investors have reaped large profits and could sell for substantial gains currently. However, today’s high rents offer income opportunities that are better than those available elsewhere, so this potential supply remains off the market. While this should be a huge opportunity for new home construction, we have noted in many past commentaries the issues of a lack of buildable lots and major local impact fees that make building such homes unprofitable. Though single-family home construction has been slowly recovering from the depths of the recession (now up 142% from the lows), sales have recently flatlined well below historical levels. The annualized rate of total new housing starts through August of this year is 1.198M with the critical single-family structures averaging 835K starts. To put that in perspective, from 1980 until the Great Recession in 2007 single family starts (chart on top of next page) averaged 1.147M. This represents a decline of over 27% during a period in which the U.S. population had grown over 25%. Florida and Texas represent 25% of the single-family homebuilding market through August of this year. The impacts of Hurricanes Harvey and Irma will obviously impact this data over the next few quarters. The subsequent demand for construction materials and labor to rebuild will also have ripple effects in other markets in the form of higher construction costs and thus even higher prices. As noted previously, a potential headwind to the anticipated rebuild and construction boom may be found in the supply of construction workers. The unemployment rate in the U.S. construction sector currently stand just above 4% less than half the levels experienced during prior natural disasters such as Hurricanes Sandy and Katrina. This will likely elongate the reconstruction cycle. We expect a decline in activity over the next few months with a corresponding pickup in 2018. Again, much of this will be noise as the trends continue to weaken. We have noted for the better part of two years what we felt were peak auto sales and the expectations for a rolling over from these levels. During the final four months of 2015, total light vehicle sales averaged just short of an annualized rate of 18MM – a level also reached in December 2016. The first eight months of 2017, however, showed the anticipated decline to an annualized level below 16.8MM with the trend continuing to soften. New car sales in September soared to an annualized rate of 18.47MM total light vehicles. According to car shopping website Edmunds, new car sales in the Houston area alone jumped 109% in the three weeks following Hurricane Irma compared with the three weeks before the storm. The chart below highlights previous one-time sale surges caused by 0% financing in the wake of 9/11, Hurricane Katrina in 2005 and the Cash for Clunkers program in 2009. After these spikes, sales revert quickly back to trend. We expect some elevated short-term readings over the next few months as the hundreds of thousands of destroyed vehicles in Texas and Florida are replaced. Bloated inventories leading to record dealer incentives of over $4,000 per vehicle are adding to current sales. But we expect the softening trend to resume. Much has been written about the synchronized global acceleration that we are experiencing in 2017 and we are enjoying a year with the most countries expanding since 2007. The global headwinds of a strong U.S. dollar and collapsing energy prices have faded. Global industrial production has grown from less than 2% in 2016 to greater than 3.6% this year with global trade up 5%. The International Monetary Fund (IMF) now pegs global GDP growth at 3.6% compared with 3.1% last year. While the trend of global growth is very positive, when comparisons are made to 2007 we must note that global growth averaged over 5.3% from the period of 2005-2007. From across the pond it appears that the United Kingdom may have weathered much of the storm that was immediately feared in the aftermath of the decision in June of 2016 to exit the European Union. While growth has clearly softened in 2Q to an annualized rate of 1.2% (chart below left), it remains at a year-over-year level of 1.7%. The unemployment rate has dipped to 4.5% with faster than anticipated job growth and better than feared retail spending through much of the summer. We still feel that it is premature to conclude the overall impact regarding the Brexit process as, until some of the uncertainty is cleared up, many businesses may adopt a wait-and-see attitude regarding investment spending. 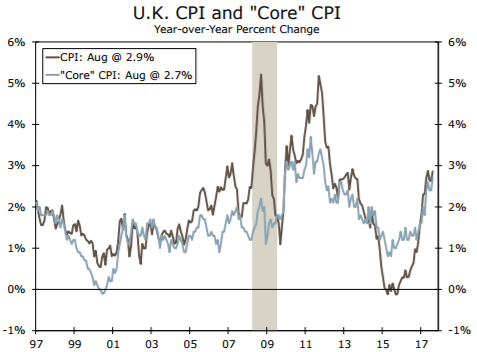 To the locals of the United Kingdom, things on the ground may not look quite as pleasant as inflation has shot much higher to 2.9% from below 1% at the time of the referendum (chart above right). The root cause remains the marked depreciation of the sterling. Though the pound has recently rebounded by about 10%, it remains 12% below levels of June 2016. The impact on the consumer is pronounced and real average weekly earnings growth has now contracted -1.2% from year ago levels. It is debatable how long it will be before this challenges consumer spending. 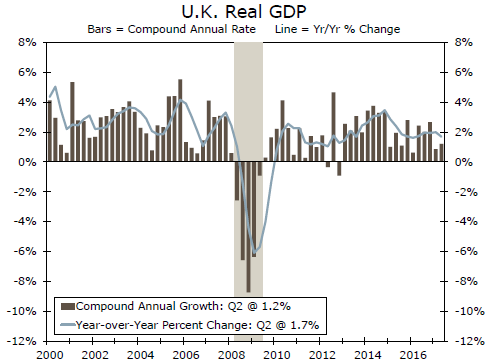 Unlike most central bankers in the developed economies, monetary policymakers in the U.K. are facing too fast rather than too slow inflation along with a slowing economy. Though in mid-September the Bank of England (BoE) stated, “some withdrawal of monetary stimulus is likely to be appropriate over the coming months in order to return inflation sustainably to target”, we feel this will only be the removal of the emergency rate cut effected following the referendum. Despite damaging the purchasing power of UK citizens, the BoE is in a quandary until the Brexit process and its impact have greater clarity. In contrast to the tepid growth rates in the UK, the European economic expansion is becoming more broadly-based amid steady employment gains and improving business sentiment. Strengthening economic growth in the rest of the world has also helped bolster export growth in the euro area despite the very strong currency. 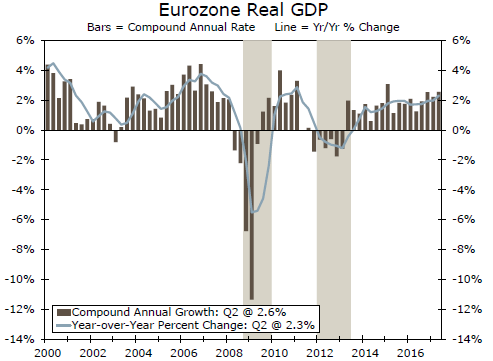 The 2Q GDP reading for the Eurozone of a 2.6% a/r includes Spain enjoying the best growth in over two years; the best in six years for France; and the highest rate of growth in Italy in over 17 years. Indeed, this growth rate is at the fastest pace since 1Q 2011 (chart below left). 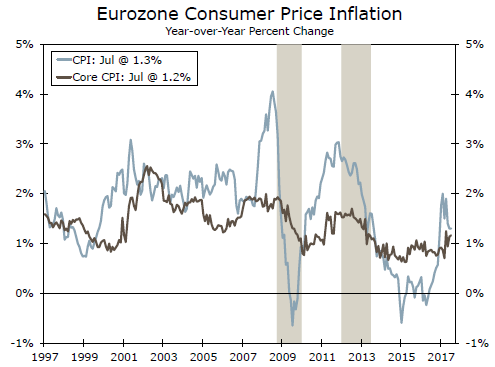 As with several other advanced nations, Eurozone monetary policymakers face a challenging conundrum; the unemployment rate has reached an eight-year low, but core inflation remains frustratingly low and below the target of the European Central Bank (ECB). Though headline inflation has declined from 2% early in 2017 to the most recent level of 1.3% that is mostly due to energy costs. Core inflation readings have moved from 0.8% in early 2017 to the most recent final reading for August of 1.2% (chart below right). As such, policymakers at the European Central Bank (ECB) will likely proceed with caution in the months ahead as it begins to tamp down the policy stimulus. One area of potential concern facing the ECB is the currency which has risen more than 5% on a trade-weighted basis this year and 13% versus the U.S. dollar. Stronger-than-expected economic data, which have prompted expectations of less accommodative ECB monetary policy going forward, undoubtedly have contributed to the appreciation of the euro. Will this euro strength (which lowers import costs) impact the recent and needed rise in inflation and slow export growth? Such changes in import prices tend only to impact goods that are a smaller component to the core CPI calculations than services. Therefore, the overall impact should be muted. As 45% of Eurozone trade is within the Euro area, we feel the impact on exports to be modest also as exports are more closely correlated to global growth. Despite expectations for a continued softening, China’s growth has surprised positively so far in 2017. Clearly, a favorable global economic backdrop has aided the export sector more than anticipated and 2Q GDP lifted the year-over-year growth rate back up to 6.9% (chart below). The government’s commitment to growth stability will continue, and the tightening policies which have taken place in the housing and financial sectors are not expected to start hampering credit supply to the real economy to any significant extent. The incremental growth driver continues to be the gradual shift from the investment-based economy to one of consumption. Though the shift is still in the early stages, consumption is being boosted by rapidly rising wages while due to demographic reasons the increase in employment is very small. Estimates have real wages rising as much as 5% over 2016 and this, along with rising house prices, should continue to benefit consumption. 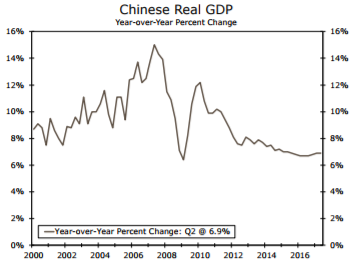 The widely concerning challenge to the Chinese economic growth model continues to be the reliance on credit related to years of an investment-based growth model. On September 20th, S&P downgraded the credit rating of China from AA- to A+ citing the increased economic and financial risks created via this prolonged period of strong credit growth. 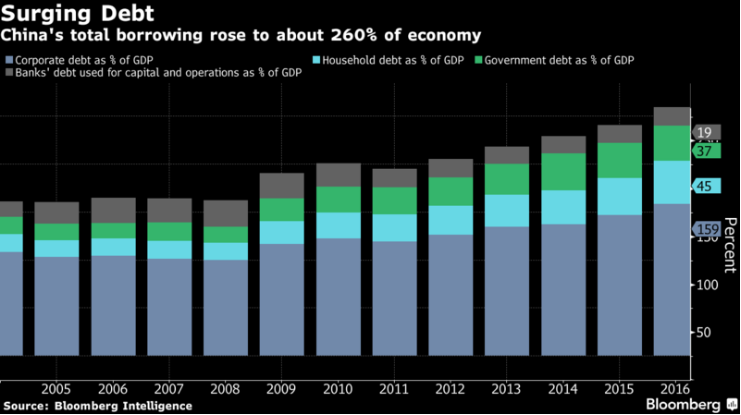 As the chart below indicates, total debt in China has increased to 260% of GDP from about 175% coming out of the financial crisis. The International Monetary Fund (IMF) recently increased its estimate for China’s average annual growth rate through 2020, while warning that it would come at the cost of rising debt that increases medium-term risks to growth. Without a reliance on foreign funding (foreign investors make up less than 2% of the domestic bond market), the impact on China should still be fairly limited. 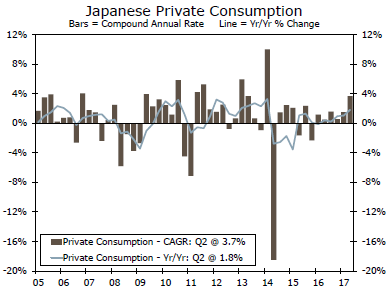 Though revised down from the initial reading, 2Q GDP growth in Japan of 2.5% (chart below left) still represented the highest annualized rate since 1Q 2015 marking the sixth consecutive quarter of expansion, the longest such streak since 2005-2006. As expected, the early stages of the expansion in Japan were characterized by a large reliance on trade. However, domestic demand picked up strongly in 2Q and has continued in the early reads for 3Q. While the 2Q reading reached an annualized pace of 3.7% (chart below right), spending accelerated in August to a 6% gain over the prior month, the second fastest pace since the recession. 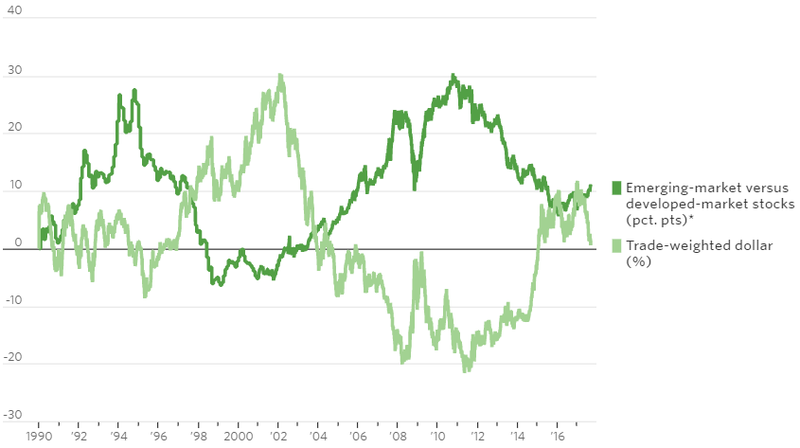 Though wage gains have been tepid, the unemployment rate held steady at 2.8%, the lowest since 1993 propagating greater consumer confidence. Interestingly, even as other banks are normalizing or at least talking about normalizing monetary policy, the Bank of Japan (BoJ) has resolutely resisted signaling anything to financial markets in the way of policy tightening. As other central banks gradually raise rates, the BoJ has not appeared to alter its stated course at all. The most recent final reading on CPI (excluding food) rose to +0.7% y/y from +0.4% in July. However, all of the inflation appears to be centered in food and the core CPI (ex-food and energy) was unchanged from year ago levels. The pressure is mounting on Prime Minister Shinzo Abe to abandon the inflation targeting. The pressure is coming from the financial industry hamstrung by the low rate environment and political support may be waning. The snap election called for October 22 may be key to determining future policy. The International Monetary Fund (IMF) in its most recent World Economic Outlook estimates the growth of emerging market economies to come in around 4.6% in 2017 with a slight increase to 4.8% in 2018. This compares with the 4.3% GDP gains of 2016. The 10% decline in the U.S. dollar until the slight rebound in September has moved the MSCI EM currency index to near three-year lows and reduced inflationary pressures to the lowest since the end of the recession. This has reduced pressure on central banks allowing them to lower rates in many emerging countries to further enhance growth. Though aggregate emerging market inflation did rebound a bit in August the reading still represents a year-over-year inflation level near an 8-year low of 3.8% (chart below). We have often noted the improving structural outlook over the last several years for these countries as their enhanced exchange rate flexibility reduces the risk of external shocks. More debt is local, current account deficits are lower and foreign exchange reserves are higher. Nonetheless, there remains a high correlation to the U.S. dollar due to the amount of dollar-denominated debt that still exists (a lower dollar lowers the cost to service, roll over and pay back the debt). The chart below depicts this high correlation and represents the biggest risk to the continuation of the emerging market thesis. Through the opening two quarters of 2017, corporate earnings growth as represented by the S&P 500 has moved ahead at an annualized rate of about 12%. That is the fastest rate of earnings growth since the bottom of the earnings cycle in 2010. Consensus estimates at the start of the year were for a full year gain of over 10% to $131. Throughout the early stages of the new administration, we have remained more circumspect on the corporate earnings impact from fiscal initiatives for 2017 and the ability of a very divided Congress to move forward quickly on its aggressive pro-business agenda. Though this view was correct, we underestimated the powerful impact of global growth and the weak U.S. dollar on earnings that continue to meet and exceed analyst’s expectations. The collapse of the energy sector impacted overall S&P earnings in 2015 and 2016 and the easy year-over-year comparisons clearly benefitted overall growth as the increase in energy sector earnings has added over 30% of the incremental growth in the index. Though the back half of the year will benefit less from these easy comparisons, we estimate 3Q earnings growth to exceed 6%. This rebound in earnings growth has been most welcome to a market that still appears very extended on most all valuation metrics. Since the beginning of 2012, earnings have grown just over 3.2% per year. 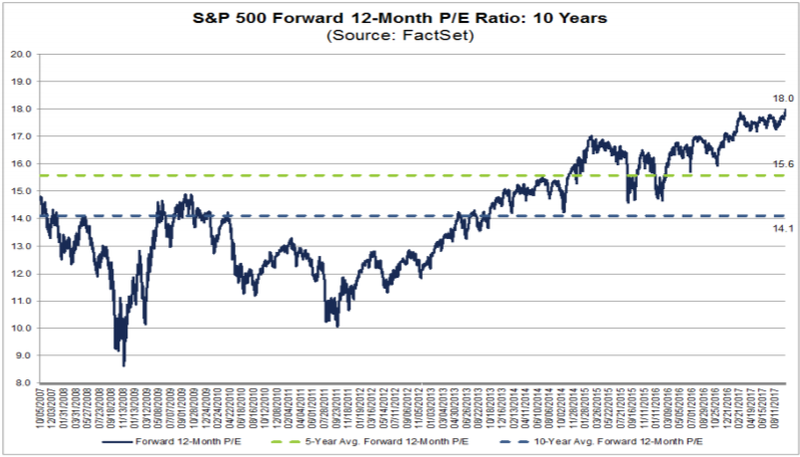 The doubling in the S&P 500 Index since the end of 2011, has been driven in large part by the expansion in the P/E multiple from 11x to 18x forward expected earnings (chart below). This metric compares to a 10-year average of 14x and now sits at the highest level in the last 15 years. As noted in this month’s Portfolio Commentary, the market continues to exhibit extremely low levels of volatility as it climbs to new records. The S&P 500 has posted a positive return in every month so far in 2017, a feat only equaled once (1995) in the last 90 years. 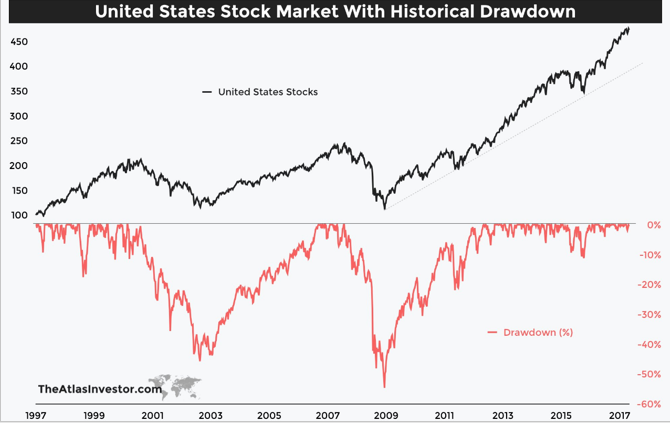 Additionally, the -2.8% decline between March 1st and April 13th represents the smallest intra-year maximum drawdown in history for the major market indices. Indeed, as the 20-year chart of peak to trough intra-year declines illustrates (chart on following page), the entire last five-year period for the S&P 500 (highlighted by concerted global central bank liquidity) is a marked outlier of extremely low volatility. As Hyman Minsky is famous for saying, “stability breeds instability”. 3Q represented another strong quarter for the major indices with the S&P 500 adding 4.5% to bring the year-to-date increase to 14.2%. The dramatic divergence between Growth and Value widened further with the Russell 1000 Growth Index now up 20.7% for the year while the Russell 1000 Value Index has returned only 7.9%. After pausing in the second quarter, the Russell 2000 Index of domestic, small capitalization companies gained 5.7% during the quarter and is now ahead 10.9% for the year. The strongest equity returns continue to be found outside the U.S. markets with the MSCI EAFE Index of developed countries enjoying a year-to-date return of 20% and the MSCI Emerging Market Index up 27.8%. Both have been major beneficiaries of continued weakness in the U.S. dollar. Though interest rates ended the quarter on the rise, the continued calls for the end of the bond bull market were again premature in the 3Q period with the Barclays Aggregate Bond Index ahead 3.1% for the year with the Barclays Municipal Bond Index up 4.7%. The Barclays High Yield Index gained another 2% during the quarter and is now up 7% for the year. At Coho Partners our focus remains on downside protection. We seek to provide this from the construction of a differentiated portfolio populated with high quality companies with resilient earnings streams, growing dividends, strong balance sheets and reasonable levels of expectations and valuations. At a time when global central banks and the Federal Reserve seem intent on removing much of the interest rate accommodation that has lifted asset values to elevated levels, we feel this philosophy is very well suited to address the challenges facing investors.